Construction aid was a physical tool – and indeed a key tactical manoeuvre – of international diplomacy that became especially obvious during the Cold War period. Among the outcomes of construction aid were cultural and technical exchanges between the donor and recipient countries. This essay examines the typical construction aid projects gifted by the Chinese Communist government and professionals to developing countries in Asia and African during the era of Chairman Mao Zedong, with a focus on key Asian examples. The remarkably high percentage of national income spent by Maoist China on construction aid might have increased the burden upon the lives of ordinary Chinese people, yet they gave Chinese architects rare opportunities to practice Modernism in overseas environments. The strength of the technical forces of the Chinese Communist state, and the wisdom of Chinese designers, were notably crystallized through a series of conference halls and stadiums built across Asia. These construction aid projects informed similar designs back in China, which led in turn to further innovations that could then again be exported abroad. Altogether it represents an important non-Western strand within Modernist architecture of the twentieth century. Development aid became particularly apparent and active as a diplomatic tool and manoeuvre after the Second World War. From 1948, for instance, the United States of America (USA) led post-war European reconstruction through what was known as the Marshall Plan. Through this mechanism, the US handed out $13 billion to help the goal of restoring manufacturing production in Europe, expanding transatlantic trade, and above all preventing communism from spreading across the continent. Alongside these European initiatives, aid projects funded by the USA and related emerging multilateral organizations – such as the World Bank, UNESCO, OECD and the Ford Foundation – were pursued in Africa, forming in countries there an emerging post-colonial townscape [1: p. 161–191]. As the USA’s main competitor in the so-called ‘First World’, staunchly led by the General Secretary of the Communist Party, Joseph Stalin, the Union of Soviet Socialist Republics (USSR) soon announced its own Molotov Plan for aid activities in developing countries. Construction aid projects – always one of the central components of such assistance whether from communist or capitalist sources – thus became critical in ‘incorporating post-colonial countries into the ideological discourses of the Soviet Union and the United States’ [2: p. 299–307]. These architectural projects provided timely assistance to developing countries, helping to relieve social difficulties and acting as symbols of diplomatic friendship and cultural exchange between nations and peoples. They also supplemented mainstream Modernist developments in Europe and North America, presenting their own unique notions of ‘Third World Modernism’ or ‘Tropical Modernism’  [4: p. 396–411]. Based on its own variant of socialist ideology, China began to provide economic and technological assistance to other countries during the 1950s, soon after the founding in 1950 of a new government led by the Communist Party Chairman, Mao Zedong, and despite a tough economic situation at home . After its previously friendly relationship with the Soviet Union deteriorated in the 1960s, China expanded even more its aid projects to promote its own diplomatic relationships across the world, becoming one of the major donor countries that were outside the OECD’s western-dominated Development Assistance Committee (DAC). In 1964, China published the ‘Eight Principles of Foreign Economic and Technical Assistance’ to coordinate its growing foreign aid activities, with a variety of aid activities and policies being duly implemented. According to official Chinese government information, by 2015 well over 2,000 aid projects had been delivered to more than 160 countries worldwide. Of this total, it is probable that over 1,500 buildings were constructed, including parliament houses, convention centres, stadiums, gymnasiums, theatres, schools, hospitals, libraries and railway stations. As however the official Chinese data does not itemise these donated buildings, simply including them within what it terms ‘completed projects’, we have had to estimate the number based on the actual cases we have managed to collect together (Figures 1 and 2). 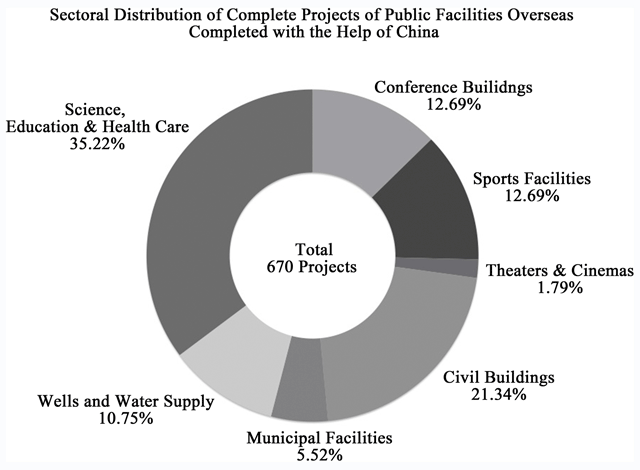 Chinese construction aid statistics: proportions of building typologies according to the authors’ database. [Drawing by Wei Chang]. 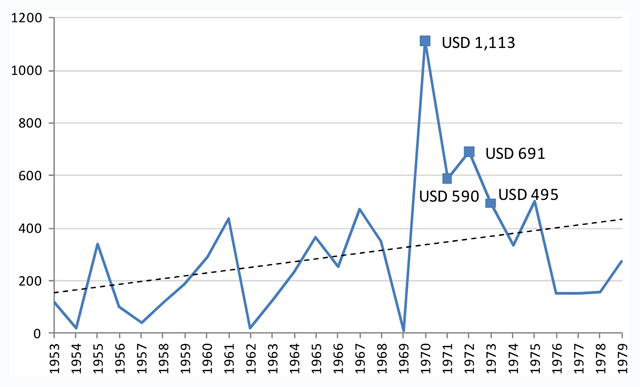 Chinese construction aid statistics: levels of foreign aid funding from 1953–79. [Drawing by Wei Chang]. Construction aid was always a kind of top-down activity, negotiated and agreed between the donor and recipient governments. Donated buildings as part of development aid strategies by western nations are fairly obvious and have regularly been written about [3, 4], while Cold War designs by architects in Soviet Russia or its Eastern European allies have become far better documented in the past ten years . However, China’s overseas construction aid, amounting to trillions of dollars and significant physical efforts over the past 60 years, has rarely been analyzed in academic studies or even heard about in the news. This ignorance may be attributed to the opaqueness of China as the donor country, or to the perceived ‘peripheral’ location of the recipient countries, or to the weak architectural cultures of these recipient nations. This essay therefore aims to fill this significant gap in knowledge by focussing on the era of Chairman Mao Zedong, who presided between 1950 and 1976, in order to examine typical construction aid projects of this initial period. Given that Chinese foreign aid began in its own vicinity, in the eastern and southeastern parts of Asia, the examples will be taken from that region. This will contribute to a better understanding of Chinese and Asian twentieth-century architecture, and of the dynamic between stakeholders in the donor and recipient countries. By analysing these early projects, one can also understand better the surge in the wave of Chinese overseas construction projects in the first two decades of the twenty-first century, as part of a continuing spread of its commercial and strategic intentions across Asia, Africa, Oceania and Latin America. Any newly founded government usually establishes its legitimacy in two ways, by enhancing domestic productivity and maintaining a peaceful international environment. In the early 1950s, the communist regime of the People’s Republic of China immediately encountered the full force of the political and military tensions of the Cold War with the western capitalist powers, most disastrously through the Korean War of 1950–53. To consolidate its power in such a hostile geo-political climate, China aligned itself initially with the USSR, from which it accepted much-needed economic aid. During the 1950s the Soviet Union and its Eastern European allies helped to build up China’s industrial base through 156 heavy industry schemes, including construction projects like the Sino-Soviet Friendship Buildings in Beijing and Shanghai, and the First Vehicular Factory in Changchun . By the early 1960s, however, the relationship between China and the USSR had deteriorated badly due to ideological differences between Chairman Mao Zedong and the Soviet leader, Nikita Khrushchev, after which Soviet experts and any financial support were ruthlessly withdrawn from China. In 1955, the Chinese Premier Zhou Enlai narrowly escaped an assassination attempt while en route to the Bandung Conference in Indonesia, a meeting mostly of the newly independent Asian and African states. Zhou participated nonetheless, and his moderate and conciliatory attitude, particularly his promotion of the ‘Five Principles of Peaceful Coexistence’, helped to formulate a concluding declaration that allayed the doubts and fears of some of the anti-communist delegates about China’s global intentions . Shortly after the conference, China established diplomatic relations with more than twenty Asian and African countries and began to strengthen trade activities and expand foreign aid accordingly. While the Soviet experts had helped China to establish a comprehensive system of industrial production, the assistance that China now offered to economically undeveloped countries was intended more to enhance its international image and prestige. This use of economic aid as a tool to underpin strategic, economic, and diplomatic aims had been initially demonstrated in 1958 in an official document written by the Central Committee of the Chinese Communist Party, titled the ‘Request for Instructions on Strengthening Leadership in Foreign Economic and Technical Assistance Work’. The report emphasized that historical similarities in the ideologies and experiences of China and the recipient states should play a critical role in determining the direction of Chinese aid . As a spiritual leader of the ‘Third World’, Mao Zedong and his government strove to help their poorer ‘brothers’ in Asia and Africa to fight with the older and newer ‘colonists’, as Mao believed that helping one’s friends was the best way to weaken one’s enemies. During the years of natural and man-made disasters in China in the early 1960s, following Mao’s ‘Great Leap Forward’ that was intended to improve agricultural output, many millions of people died from famine . However, Chinese foreign development aid never stopped and magnificent buildings were donated and constructed in Asia and Africa. In 1973, foreign aid accounted for 7% of China’s central government expenditure, with a notably high percentage in the form of donations . During Mao’s period, Chinese architecture was required to possess the features of ‘Socialist architecture’, strictly following his plans and commands. All buildings in China were now delivered by state-owned design institutes, in which teamwork dominated and individual members had little freedom to display their own creativity. Construction aid was thus inevitably set within this framework . Among the recipients, Mongolia – one of the earliest countries to recognize Chinese Communist rule – received a substantial amount of goods and funds in the late 1950s . In 1960, Premier Zhou Enlai visited Mongolia and agreed a series of donated projects. This economic and technical assistance consisted primarily of the design and construction of civic buildings and industrial factories, and China also supported this by sending over labour teams, building materials, new technological systems, and even entire sets of equipment. As the Mao Zedong government acknowledged that foreign assistance was a complex and arduous project, a few specialist Chinese institutions – such as the Central Foreign Affairs Group, the State Planning Commission, and the Ministry of Finance – were made responsible for organization and coordination of such projects . China’s Ministry of Architectural Engineering, like those other ministries, also became one of the principal agents in procurement and delivery. In terms of construction aid for Mongolia, the Beijing Industrial Design Institute, a state-owned institute affiliated with the Ministry of Architectural Engineering, was applauded for its efficient design performance during the late 1950s and early 1960s. Led by a Chinese architect, Gong Deshun, this design team realised one international hotel, two luxury villas and a department store in the capital city of Ulaanbaatar (Figure 3). In these buildings, Gong was preoccupied with combining Modernist design principles and local conditions. He therefore rejected the predominantly eclectic approach of his more recent Ministry of Building and Engineering project, completed in Beijing in 1957 (Figure 4). 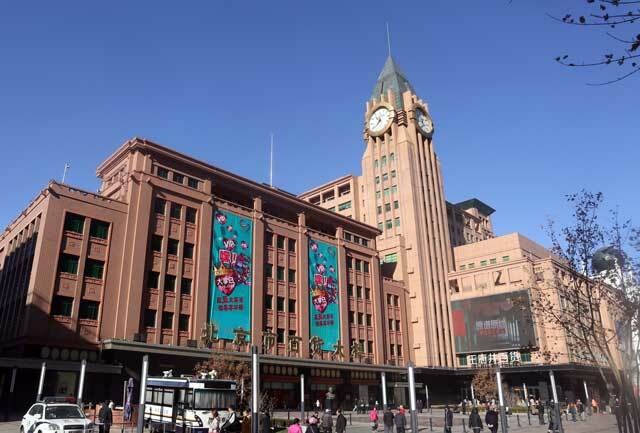 Instead the design of the Ulaanbaatar department store returned to the format and style of his building for the same function in Wangfujing, in downtown Beijing, of 1954. 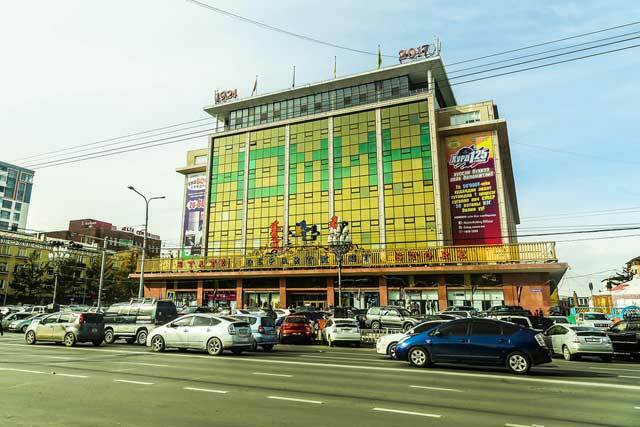 Both of these stores in Beijing and Ulaanbaatar are still in use after 60 years. Department store designed by Chinese architects led by Gong Deshun: Wangfujing, Beijing (1954; the lighter block to the right-hand side is a newer addition). [Photograph by Wei Chang]. Department store designed by Chinese architects led by Gong Deshun: Ulaanbaatar, Mongolia (1962). [Photograph by Wei Chang]. Although the discourse that characterized Beijing’s architectural field in the 1950s – often classified as Socialist Realism – was nationalist in form and socialist in content, and the application of more abstract formal languages was constrained profoundly by conservative cultural ideologies, construction aid nevertheless provided a certain opportunity for Chinese architects to explore Modernist designs in a very different context. As the architectural historian Zou Denong has noted, when compared with the complexities of domestic circumstances in China, the lesser restrictions on construction aid projects allowed architects to experiment with a more critical Modernist approach [13: p. 160]. Among the architecture that was exported during Mao’s time, one project that clearly demonstrated the skill of Chinese architects in integrating a modern vocabulary with local traditions and climatic factors: Dai Nianci’s Bandaranaike Memorial International Conference Hall in Colombo. Located in the capital of what was then still Ceylon, an island nation that had been granted independence from Britain in 1948, the country was subsequently renamed in 1972 as Sri Lanka. In 1964, Premier Zhou Enlai visited Ceylon/Sri Lanka, where the world’s first female Prime Minister, Sirimavo Bandaranaike, requested Chinese aid in a project dedicated to the memory of her husband, the former Prime Minister Solomon Bandaranaike, who had been assassinated. To understand this example of an architectural export, two significant background facts need to be mentioned. Firstly, due to the two countries’ shared historical experiences at the hands of the British Empire, and their consistent ideology of political non-intervention, bilateral relations had been on an upwards trajectory ever since the first ‘Rubber-Rice Pact’ was signed in 1952. They had a shared historical link through Buddhism, and now Ceylon was an adherent of a socialist ideal similar to that of China. Moreover, Ceylon/Sri Lanka’s strategic location in the Indian Ocean was crucial for China’s commercial and military competition with India. Secondly, just weeks before Zhou’s visit to Colombo, he had set out China’s eight principles of economic and technical assistance, emphasizing equality and mutual benefits and detaching any political conditions from the receipt of foreign aid [14: p. 388–389]. Now he needed a showcase project to prove China’s good intentions. The Bandaranaike Memorial International Conference Hall was hence the result of this specific historical context. Immediately after Zhou agreed to Sirimavo Bandaranaike’s request, the Ministry of Building and Engineering directed, once again, the Beijing Industrial Design Institute to come up with the design solution. In August 1964 a project team –which consisted of the Institute Director (Yuan Jingshen) along with the Chief Architect (Dai Nianci), a further architect (Yang Yun), a structural engineer (You Baoxian) and some other assistants – flew to Colombo to investigate there for three months. Premier Zhou Enlai especially asked this design team to listen carefully to opinions from the recipient’s side. Prior to their journey to Ceylon/Sri Lanka, the group discussed the project and identified three important principles: 1) the scale of the building should be appropriate to the recipient’s requirements, and as such not too massive; 2) the building’s form should take the tropical climate and local building style into account, and by no means be copied from China (which generally meant the architectural style of northern China); and 3) the building’s interiors should incorporate the latest state-of-the-art technology and facilities [15: p. 14–26]. These guidelines were clearly harmonious with the eight principles previously declared by Zhou on behalf of the Chinese government. Based on these shared values, and his careful site observations, Dai Nianci sketched out two alternative preliminary proposals and presented them to the Ceylonese/Sri Lankan clients. The major difference between the two options lay in the shape of the main conference hall, with the first version being octagonal and the other circular. Physical models were sent over to Colombo together with the sketches. Prime Minister Sirimavo Bandaranaike selected the first option because the octagonal shape conformed to a Buddhist pattern in traditional buildings in Ceylon/Sri Lanka – and most notably a famous traditional temple in Colombo. Completed in 1973, and occupying a prominent 13-acre site in an area of foreign embassies, the design of Bandaranaike Hall has a gross floor area of around 30,000 square metres, with this being divided into two visually separate yet interconnected parts. The main octagonal conference hall is sized to accommodate 1,500 people, while an adjacent L-shaped building with two courtyards is given over to small conference rooms, offices, dining rooms and other facilities [15: p. 24]. The design’s remarkable characteristics include a 28-metre-high auditorium, placed behind a formal reflecting fountain pool, and sitting atop a podium that is surrounded by an extensive peripheral colonnade of 40 marble columns – i.e. with five columns on each of the octagon’s sides (Figure 5). A centrally located ceremonial staircase leads directly up to the main entrance. The white marble columns decorated with patterned golden capitals support an only very slightly pitched steel roof that seems to be flat from the outside, and which is cleverly cantilevered out from the main structure to provide shade for the building’s glazed envelope (Figure 6). 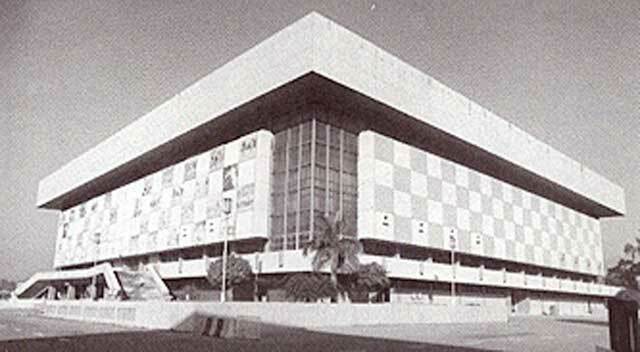 Main frontage of the Bandaranaike Memorial International Conference Hall, Colombo, Ceylon/Sri Lanka (1973). [Photograph by Charlie Xue]. Section through the Bandaranaike Memorial International Conference Hall. [Photograph by Guanghui Ding]. Given the hot climate of Ceylon/Sri Lanka, the building’s impressively furnished central auditorium was fully air-conditioned from the outset (Figure 7). However, the large encircling lobby was originally naturally ventilated through adjustable glass louvres covering all the exterior walls: this, after all, had been for a long time an acceptable convention within ‘Tropical Modernism’ that helped considerably to reduce energy usage (Figure 8). In practice, also, when the building was being finished in the early 1970s, China was still unable to provide fully air-conditioned buildings (this feature was only added to lobby during a remodelling in 2013). In their design for the Bandaranaike Hall, Dai Nianci and his colleagues were thus consciously using local construction details to signal their intention of integrating traditional Sri Lankan architectural decorations with a Modernist approach. In many aspects, the project was highly reminiscent of the American architect Edward Durell Stone’s US Embassy in New Delhi, India, completed in 1959. Auditorium in the Bandaranaike Hall. [Photograph by Charlie Xue]. Exterior glass louvres around the main foyer of the Bandaranaike Hall. [Photograph by Charlie Xue]. What this meant was that Dai’s design differentiated itself strikingly from his hitherto eclectic projects in China. Take, for instance, the National Art Museum of China, originally conceived as one of the ‘Ten Great Buildings’ that were erected to celebrate the tenth anniversary of the Chinese People’s Republic in 1959, although not actually completed until 1962 due to the scarcity of materials during the period of Mao’s ‘Great Leap Forward’ [16: p. 1–3] (Figure 9). Dai’s experimentation in blending Modernist architectural elements and local traditions was also manifested in his explicit repudiation of the dogmatic ‘Socialist Realist’ style that the USSR was trying then to export to China. One major example was the Beijing Exhibition Centre project, an extravagant building constructed in 1954 to exhibit the Soviet Union’s industrial, agricultural, cultural and economic achievements [17: p. 123–145] (Figure 10). 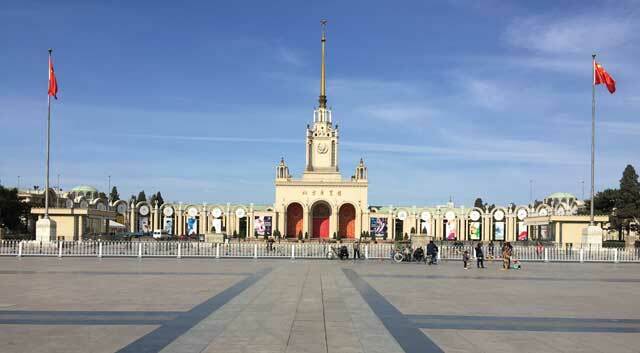 As the appointed local Beijing architect, Dai had to liaise with his Soviet counterpart, Sergei Andreyev, who insisted upon adopting a typical ‘Socialist Realist’ approach to showcase Russian Neoclassical motifs. Dai’s Beaux-Arts background and his inclination to modernism enabled him to thoughtfully mediate tradition and modernity in various contexts. Thanks to the autonomy of architectural aid, his pro-modernist ideas were materialized better in Sri Lanka than in any of his projects in China. 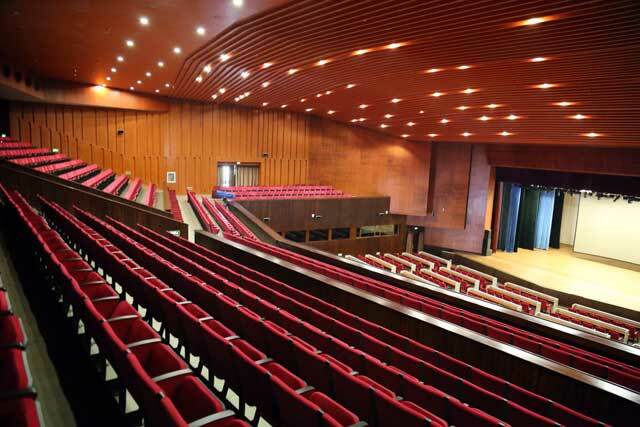 One of the Beijing cultural buildings in which Dai Nianci was involved, in this case the Fine Arts Museum (1962). [Photograph by Guanghui Ding]. Another key Beijing project involving Dai Nianci as designer, here the Sino-Soviet Friendship Building (1956). [Courtesy of CAG]. 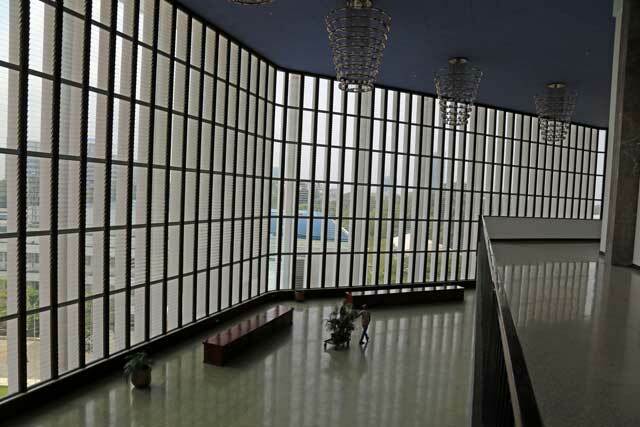 The final detailed design of the Bandaranaike Memorial International Conference Hall was in fact suspended once Sirimavo Bandaranaike ended her first term as Prime Minister in 1965 – however, after winning the 1970 election and regaining power, she requested that China continue with the project. At that point, China was embroiled in the turbulence of the ‘Cultural Revolution’, a bitterly divisive policy that lasted from 1966 to 1976. Fatefully, the architects and engineers for this project, who as part of the ‘Cultural Revolution’ had been sent off to labour camps to rethink their ‘bourgeois’ ideologies, were now summoned back to Beijing to recommence work on the project amid what was an obviously messy environment. Hence from late-1970 until early-1973, a total of about 450 Chinese technicians/builders and 900 Ceylonese/Sri Lankans were involved in the construction of the Bandaranaike Hall, with the majority of the materials and equipment being donated by China. All the timber was locally produced, albeit coated with bitumen to prevent termite damage, but following that, the entirety of the interior wooden decorations, including the delicate balustrades, were hand-made by China’s fine carpenters – around 60 of these specialist Chinese carpenters having been sent to the site. White marble was imported from Vietnam, then a Chinese ally, because in tropical climates the use of light stone surfaces helped to keep people cool [18: p. 290–295]. The architects, engineers and site staff worked in difficult conditions on the Bandaranaike Hall with very little technical help or everyday support for a period of more than three years. A total of 3,000 pieces of furniture were shipped over from China. To make 50,000 items of alloy cutlery for eating purposes in the conference centre, China devoted 1.5 tons of its silver supplies. The salaries of the Ceylonese/Sri Lankan building workers were also paid by the Chinese government, but not in money. As You Baoxian, the project’s structural engineer, told us in an interview in October 2018, each site worker was allowed to collect every year an 18-metre-long roll of Chinese cloth in lieu of payment, or else they could claim 7 kilos of rice per week. This erection of the convention centre using Chinese and Ceylonese/Sri Lankan knowledge and skills was described by both governments as being symbolic of the robust relationship between the two nations [18: p. 291]. 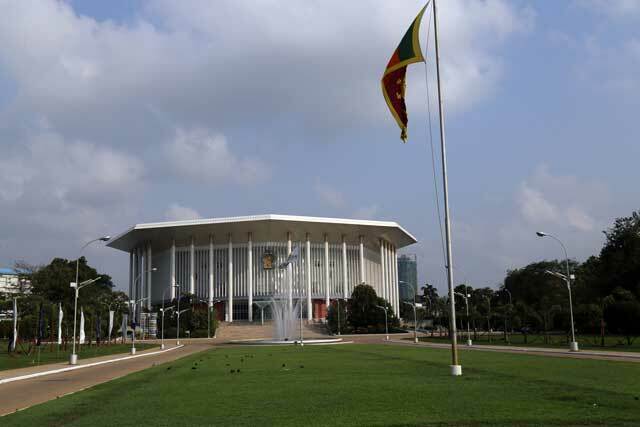 It is also a ‘special relationship’ that has endured the passage of time: on the 40th anniversary of the Bandaranaike Memorial International Conference Hall, in 2013, the Chinese government helped to renovate the building and also added auxiliary buildings to house a new research centre. Chinese architectural aid to developing countries during the Maoist era was by no means limited to the buildings discussed above. From the late-1950s until the late-1970s, a group of civic projects erected in Albania, Guinea, Mauritania, and Somalia, among others – and in addition to engineering spectaculars such as the noted Tanzania-Zambia Railway, some 1,860 kilometres long – were generously sponsored by China, even though its home economy and society were again suffering from crushing poverty and austerity at the time. In order to build the Tanzania-Zambia Railway in the somewhat barren lands of East Africa, the lives of more than 60 Chinese workers were sacrificed. Yet it was seen as necessary for geo-political reasons. At a point when Sino-Soviet relations were deteriorating, and Sino-US relations were not yet normalized, the Chinese government’s exports of economic and technical assistance – including architecture – really helped to boost trade, international trust, and perhaps most significantly, political support. In 1971, for example, the People’s Republic of China managed to replace Taiwan (known as the Republic of China) as one of the five permanent member states on the UN Security Council, thereby acquiring a greater voice in the international community: this came due to the endorsement of many African and Asian states, many of which had received China’s generous foreign aid. Among the various types of foreign aid, the help for sporting activities was initially used to support the national liberation movements in many of the developing countries in Asia and Africa [19: p. 39–41]. China had realized that the population in many of these developing countries absolutely loved sport. Sport buildings are usually regarded as venues of physical education, exercise, competition, festivals and so on, and such relate directly to people’s everyday life. Therefore, in making sports aid a pillar of its diplomatic policy, the Chinese government embarked upon the journey of designing and constructing stadiums abroad. To date, China has donated and built more than 100 sport centres – many of which include a major stadium, indoor sports hall, swimming pool and athletes’ village – in recipient developing countries. Indeed it is now the case in Africa that relatively few countries have not yet received some kind of stadium donated by China, while some countries have got three or four of them. The construction of these donated sports building dates back to 1958, with – in emulation of what was mentioned in the previous section – the first cohort being built in Mongolia. The Mongolian Communist regime in fact received the largest number of development aid projects from its socialist ‘brothers’ in China during the Cold War. One of the first stadiums to be erected with Chinese aid money was the National Sports Stadium in Ulaanbaatar, opened in 1958, which greatly contributed to the improvement of Mongolia’s sporting infrastructure and training conditions for athletes [20: p. 22–29]. Today, after 60 years, it is still the most important stadium in the country, hosting the largest annual festival of Nair (Figure 11). Following China expanded the recipient regions gradually from socialist countries to nationalist countries, such as Cambodia and Indonesia, which received indoor stadiums in 1963 and 1966, respectively. Mongolia’s main stadium built with Chinese construction aid in Ulaanbaatar (1961). [Courtesy of the China Architectural Design Group]. The examples of ‘stadium diplomacy’ during this early phase were usually linked to explicit political aims or significant sport events. They were generally built when the recipient countries were preparing or applying for major regional or international sport events, giving such buildings a far-reaching impact. For example, the GBK Stadium in Djakarta that Indonesia received as a gift from China in 1963 was constructed to host the first-ever Games of the Newly Emerging Forces (GANEFO), with the Chinese Premier Liu Shaoqi providing a total of US $18 million in order to make it happen [21: p. 257–276] (Figure 12). This came again at a time when China was suffering serious social and economic difficulties due to the three-year-long Great Famine . Similarly, in 1966 China erected the 50,000-seater Phnom Penh National Olympic Stadium plus also other sporting facilities in the capital city in Cambodia to guarantee the opening of the second-ever GANEFO tournament [22: p. 15–20] (Figure 13). The Chinese-donated GBK Stadium in Djakarta, Indonesia (1963). [Courtesy of the China Architectural Design Group]. Major sports facility in Cambodia built with Chinese foreign aid: the Phnom Penh National Olympic Stadium (1963). [Courtesy of China Architectural Design Group]. In the earliest phase, there was relatively little involvement of Chinese architects within the design process, since the stadiums were generally designed by reputed local architects or else by Soviet Russian architects. In this situation, China mainly served as an assistant that provided support through financial aid, constructional systems and labour teams. 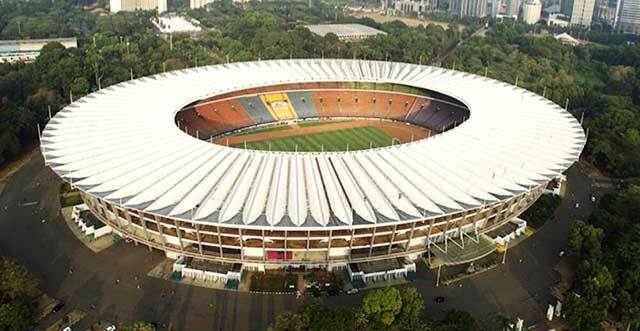 For example, the aforementioned GBK Stadium in Djakarta was actually designed by Frederich Silaban, a well-known Indonesian architect. The National Olympic Stadium in Phnom Penh was also designed by their most famous local architect, Vann Molyvann, whose works were among the most important collections of post-colonial buildings in Cambodia, termed as the ‘New Khmer Architecture’. Through collaborating with local architects in such cases, the corresponding Chinese professionals gained experience in dealing with large-span sports structures. Due to a major shift of attitudes with the United States of America after 1972, promoted by the embattled and soon-to-be-impeached US President, Richard Nixon, a series of nice ‘treats’ were handed to Pakistan, since it had acted as the middleman between China and the USA. 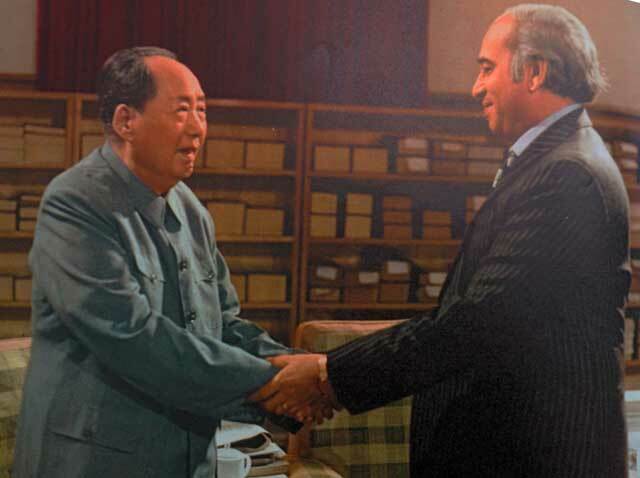 In 1974, Chairman Mao Zedong met in Beijing with the Pakistani Prime Minister Ali Bhutto (Figure 14). A construction aid project for a sports center in Islamabad was soon launched, as designed by the Design Institute in the Chinese Ministry of Construction. This sports facility included the Jinnah Stadium (50,000 seats), Liaquat Gymnasium (10,000-plus seats), Roshan Khan Squash Complex (1,800 seats), as well as Hamidi Hall, Rodham Hall and other outdoor courts and two hostels (Figure 15). As a sports centre, it has served as the highest-class facility for international football matches and field-and-track tournaments in Pakistan. By 1976 all of the construction documents had been finished, yet the sports centre was not finished until 1984 due to internal political and economic reasons in Pakistan – not least the overthrow and execution of Ali Bhutto by a new military junta. Mao Zedong met with many ‘Third World’ leaders in his later years: here a photograph records his summit in 1974 with Zulfikar Ali Bhutto, Prime Minister of Pakistan. [Image from People’s Pictorial]. Aerial view of the Pakistani Sports Centre in Islamabad (1975–84), as shown in this 1976 perspectival drawing by Wang Tianxi. [Courtesy of the China Architectural Design Group]. The designers for this Pakistani sports facility partly overlapped with the team for the Bandaranaike Hall in Ceylon/Sri Lanka, sharing their experience of working abroad. As told to us in October 2018 by the structural engineer, You Baoxian, he and his colleagues had spent three years in Colombo without visiting their families in China; now, for the project in Pakistan, he and colleagues had to stay away for another five years. In order to design the square-shaped gymnasium in Islamabad, the design team had to devise a wide span of almost 45 metres by 45 metres without any intervening columns (Figure 16). Inspired by his previous solution in Ceylon/Sri Lanka for a cantilevered umbrella structure, plus also partly by the GBK Stadium in Cambodia, You Baoxian came up with an ingenious arrangement using four groups of columns on each corner. Each of these groups of columns consisted of four substantial steel tubes of 1.1 metres in diameter. Massive trusses weighing some 1,300 tons were then rested upon these four corner cluster-columns. All this heavy roof structure including wiring and pipework had to be constructed on the ground: then, when this structure was ready, hydraulic oil jacks lifted up the entire roof from the four corners. This lifting process took a whole week for the roof to be raised up to its final position. To prepare for this complex procedure, a 1:10 scale mock test of the roof lifting was carried out in a local cinema so that the designers could obtain all of the necessary data prior to issuing the instructions. Because of the use of hydraulic jacks, the design team did not need to ship over large construction machinery from China to the site in Islamabad. Moreover, Pakistan did not possess a lot of timber, unlike the case in Ceylon/Sri Lanka. Thus the sports centre in Islamabad needed to rely instead on prefabricated components that were manufactured locally. Gymnasium in the Islamabad sports facility, supported on its four corner cluster-columns. [Courtesy of the China Architectural Design Group]. You Baoxian and his colleagues hence carried out in Islamabad a successful testing of a ‘four-column-lifting’ technique that was later applied to sports buildings in Syria and Barbados, as designed by the same firm. While the Pakistani sports centre was still under construction, new developments in China led to the removal of conservative forces after the death of Mao Zedong in 1976, with the new Communist Party Chairman, Deng Xiaoping, embarking upon the ‘Open Door’ policy that would lead in time to rampant quasi-capitalist development in China. Thereafter, the whole country became motivated by rapid economic growth and urban construction. The old fishing town of Shenzhen, which bordered what was at that point still the British-run capitalist enclave of Hong Kong, was turned into a Special Economic District in the early-1980s, triggering a massive expansion. The Design Institute of the Ministry of Construction duly set up a branch office in Shenzhen. One of its most prominent projects was the Shenzhen Gymnasium, completed in 1985 (Figure 17). Its designers, Liang Yingtian and other colleagues, just happened to be colleagues of You Baoxian, and so they applied the same technique of lifting up the space-frame trussed roof. They however further improved the design by exposing the gigantic corner columns and cantilevering out the spectator stands. This gymnasium won many awards in China and abroad due to its unique and elegant structure. Unfortunately, however, it was demolished early in the twenty-first century, and yet in this case it was clear that techniques as learned from built experiments in foreign countries were being transformed into the design and construction of parallel projects within China. Building technique as applied to a similar project back in China: the Shenzhen Gymnasium (1985). [Photograph by Sun Cong]. This essay has focused on Chinese construction aid projects in other Asian countries during the era of Chairman Mao Zedong. It was generally a depressing time in which a population of around 600 million people only chose to follow one man’s utopian vision that often did not work out well, and so they lived vulnerable and bitter lives as a result. Architectural design within China under Mao tended to be carried out within a Socialist Realism framework for official buildings, and construction innovation remained relatively sparse for what was such a populous country. China’s desire to unite the ‘Third World’ coincided with the aspirations for development among many developing countries that had only recently won their independence from European colonial rule. Within this climate, Chinese construction aid projects were used as a physical tool for its international diplomatic ambitions. The high percentage of development aid in the Chinese government’s expenditure often ran against obvious common sense: in other words, the many ‘luxurious’ gifts involved in construction aid, as donated to foreign countries, contrasted starkly with the dire conditions for most people in China domestically. This could only happen in a country with an absence of democratic channels whereby people could voice their opinions. However, whenever the Chinese architects involved came to face detailed building tasks, they returned again and again to the ontological problems posed by architecture – i.e. plan, section, elevation, structure, materials and construction methods. Chinese construction aid during the Maoist era provided a distinctive opportunity for domestic architects to explore individual expression with a greater degree of autonomy, given that they were usually restrained by social, political and ideological circumstances within their own country. Construction aid projects therefore gave Chinese architects another platform on which to display, practice and learn from the outside world. A process of learning from architects in western nations and in recipient countries sometimes inspired the design method and language, for example in the adoption of ‘Tropical Modernism’ in some projects. These outcomes were also able to inform design developments in China, and in turn further construction aid projects abroad. All of this enriched Chinese design and added to the body of knowledge and skills among its architects and technologists. Construction aid projects also often involved local building workers and technicians, thereby helping knowledge production and employment opportunities in the recipient developing countries. During the Cold War, many Soviet Russian and East European architects worked not merely on construction aid projects abroad, but could also directly export their design skills by working as planning and design consultants in a number of Asian and African countries. In contrast, however, Chinese architectural exports were always closely linked to the intentions of the country’s development aid policy. Only now in the twenty-first century have China’s architectural exports been able to expand dramatically in their ambitions, as a part of the country’s widened ambitions for economic and technical assistance. Alongside the projects being carried out by Chinese central government ministries, or by provincial and municipal bureaucracies, a range of state-owned enterprises and private firms are now closely involved in the global architectural market. Some individual Chinese architects such as Wang Shu have thus found that they can compete in the international design scene, yet all of these outward-bound competitive activities owe their existence to the first steps that were made during the Maoist era, as discussed in this essay. In 2013, China launched an ambitious initiative entitled ‘The Silk Road Economic Belt and the 21st-Century Maritime Silk Road’ – perhaps better known as the ‘One Belt, One Road’ policy – which has since been embraced by over 60 countries across Asia, Africa and Europe. Indeed, an Asian Infrastructure Investment Bank was established for this very purpose in 2015. The ‘One Belt, One Road’ scheme is a natural extension of China’s engagement with and support of developing countries during the course of the twentieth and early-twenty-first centuries. More infrastructure and building projects will undoubtedly be generated and carried out within this ‘One Belt, One Road’ era. In shouldering the commission set out by the state, Chinese professional architects and engineers will be among those that spearhead this new initiative. Yet reviewing the experiences of the past decades may well help to guide future Chinese architectural developments in a healthy way. This paper is part of a study supported by City University of Hong Kong, Project No. 7005135, 7004966; National Natural Science Foundation of China, Project No. 51878584; and the Beijing Advanced Innovation Centre for Future Urban Design, Project No. UDC2016020100. The authors heartily thank the patient help and editing input of Professor Murray Fraser, and also the constructive critiques and suggestions from the two anonymous reviewers. Lu, D (ed.). 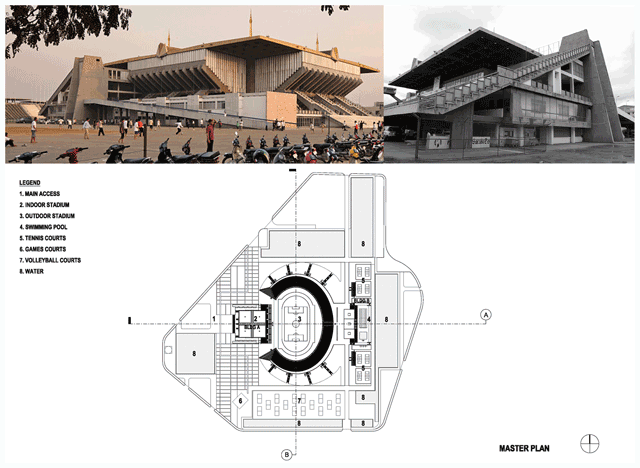 Third World Modernism: Architecture, Development and History. Routledge; 2011. People’s Republic of China State Council Information Office. White Paper on China’s Foreign Aid; 2009. Dong, Z and Wu, J. Xin zhongguo gongye de dianjishi: 156 xiang jianshe yanjiu, 1950–2000 (The Industrial Cornerstone of New China). Guangdong Economic Press; 2004. Doak Barnett, A. Chou Enlai at Bandung: Chinese Communist Diplomacy at the Asian-African Conference: A Report from A. Doak Barnett. American Universities Field Staff; 1955. Zhongyang Wenxian Yanjiushi (The Central Committee of the Chinese Communist Party Literature Research Office) (eds.). Selected Important Documents since 1949, Vol. 11. The Central Committee of the Chinese Communist Party Literature Press; 1992. Mao, Z. Selected Works of Mao Zedong, Vol. 6. People’s Press; 1982. Dikotter, F. Mao’s Great Famine: The History of China’s Most Devastating Catastrophe, 1958–62. Bloomsbury; 2010. Dangdai Zhongguo Congshu Bianweihui (Editorial Office of Contemporary China Series). Dangdai zhongguo de duiwai jingji hezuo (Contemporary China’s Foreign Economic Cooperation). Social Sciences Press; 1989. Zou, D. Zhongguo jianzhushi tushuo: xiandaijuan (A Pictorial History of Modern Chinese Architecture). China Architecture and Building Press. 2001; 160. Ministry of Foreign Affairs and the Central Committee of the Chinese Communist Party Literature Research Office (eds.). Zhou enlai waijiao wenxuan (The Diplomatic Documents of Zhou Enlai). The Central Committee of the Chinese Communist Party Literature Press. 1990; 388–389. Yuan, J, Liu, S, Wang, X and Liu, F. ‘Jianyuan, fazhan, zhuangda (The Establishment of the Institute, Development and Expanding)’. In: Wang, J, et al. (eds. ), Zhongguo jianzhu sheji yanjiuyuan chengli wushi zhounian jinian congshu: licheng pian (The 50th Anniversary Album of China Architecture Design and Research Group: History). 2002; 14–26. Tsinghua University Press. Dai, N. Zhongguo meishuguan sheji jieshao (Introduction to the Design of the National Art Museum of China). Jianzhu xuebao (Architectural Journal). 1962; 8: 1–3. You, B. ‘Yi bandalanaike guoji huiyi dasha de sheji (Recalling the Design of Bandaranaike Memorial International Conference Hall)’. In: Jianzhu, Z and Yanjiuyuan, S (eds. ), Jianzhushi zhaji (Architect’s Notes). 2007; 290–295. Tsinghua University Press. Yu, D and Yuan, L. ‘Woguo Tiyu Duiwai Yuanzhu de Lishi Huigu (Historical review of sport aid of our country)’. Journal of Beijing Sport University. 2010; 8: 39–41. Yu, D and Li, Y. ‘Wuchang yu hezuo, woguo tiyu duiwai yuanzhu fangshi yanjiu (Gratis and cooperation, a study of the sport aid model of our country)’. Journal of Wuhan Institute of Physical Education. 2016; 50(6): 22–29. Fan, H and Xiong, X. ‘Communist China: Sport, Politics and Diplomacy’. In: Fan, H and Mangan, JA (eds. ), Sport in Asian Society: Past and Present (Sport in the Global Society). 2005; 257–276. Taylor and Francis. 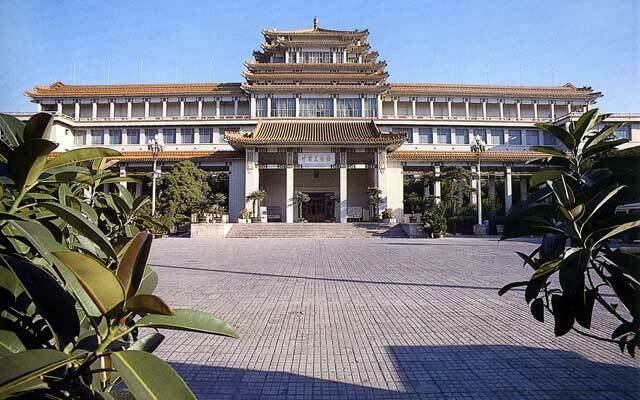 Gu, T. ‘Woguo yuanwai tiyuchangguan jianzhu (Sport Buildings Aided by Our Country)’. Sports Culture Guide. 1983; 1: 15–20.